This weeks KOH listener coupon. 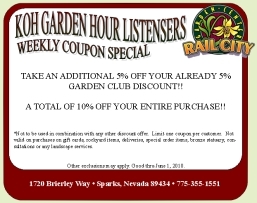 TAKE AN ADDITIONAL 5% OFF YOUR ALREADY 5% GARDEN CLUB DISCOUNT!! A TOTAL OF 10% OFF YOUR ENTIRE PURCHASE!! Click the image above for our printable Weekly Listeners Special.